Rickenbacker 330, 12-String Semi Acoustic Guitar, Walnut As part of arguably Rickenbacker's most recognisable model range (the 300 series),..
As part of arguably Rickenbacker's most recognisable model range (the 300 series), the 330 has been a mainstay on the popular music circuit since its introduction in the late 1950's, and is regularly associated with many key "jangle-rock" sounding guitar players from the 1960s and 1980s - including Tom Petty, Paul Weller, Thom Yorke and The Beatles. 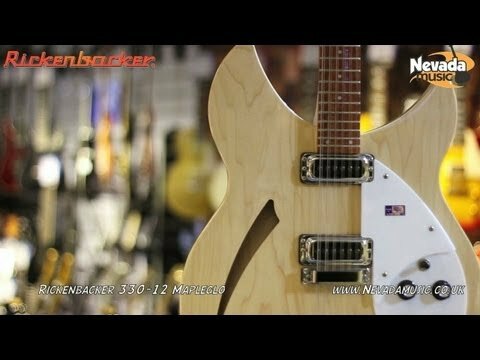 This particular Rickenbacker 330 is the 12-string model, and differs a little from the standard models. For a start it's made of a Walnut body (rather than Maple), Maple fretboard (instead of Rosewood), and has a natural satin finish as opposed to the usual lacquered opaque look. All other appointments are the same as usual, including the two High Output Rickenbacker single coil pickups, "R" tailpiece, teardrop scratchplate, and that awesome Blend control knob.